It has been awfully quiet on the public front here for sure, but I have been working on quite a bit of things behind the scenes here at Etherkit Galactic HQ. It’s been a challenging year since I last wrote about the personal things going on here, but things have been going reasonable well after a rough half-year immediately following that post. I’m just about ready to attempt to revamp Etherkit, however there are still a few challenging roadblocks to overcome, and I could use a bit of guidance. The most difficult issue is trying to re-bootstrap the business financially. I’m currently only selling the Si5351A Breakout Board, which obviously isn’t enough to expand a business upon. The possibility of a capital infusion unfortunately broke down, and so the only practical way forward at this point is most likely another crowdfunding campaign. As mentioned in the opening paragraph, I have been working on various projects, and so I do have some candidates. Many of the projects that are in the works or only even in the planning stages require the use of a microcontroller, and so last year I decided to make my own Arduino-compatible microcontroller board family which I can then use as the heart of many of these products. I’ve taken a real liking to the Arduino Zero because of its speed and features, but the cost is fairly high and the standard Arduino form factor isn’t great for many purposes. Therefore, I have decided to make a new standalone board derived from the Zero which I call Empyrean, and you can see in the photo at the top of the post. It comes in two flavors: Alpha and Beta. The Alpha is based on the Atmel ATSAMD21G18A microcontroller, same as the Arduino Zero. The Beta uses a controller (ATSAMD21G16B) with a bit less flash and RAM than the Zero (but still more than an Arduino Uno), but is also priced similarly to the ATmega328 line of microcontrollers. Both come on a small board similar in size to the Nano and has nearly all of the same circuitry of the Arduino Zero except for the EDBG support. It is true that there are a flood of Arduino clones out there and this makes entering the market with another one somewhat crazy. My value proposition for Empyrean is based on the confluence of breadboard-friendly form factor along with a wallet-friendly price. My target price point is around $15 for Alpha and $10 for Beta. While that is a fair bit more than your typical eBay Nano clone, Empyrean would also be quite a bit more powerful than a Nano, in both clock speed and available memory. So my question to you, dear reader, is whether you would be interested enough in this product to back a crowdfunding campaign in order to have it made? I do plan to make a serious push on a radio soon, but it would be nice to ramp up the business before that, while also solidifying the microcontroller platform that will be used in future products. Let me know what you think in the comments, or send me an email. In the mean time, I thought I’d let you know that I’m working on a Rev D board spin of the Si5351A Breakout Board. You can see a prototype in beautiful OSHPark purple above. The most significant changes in this revision will be to change the coupling of the reference oscillator to the Si5351 XA input pin to meet datasheet specs and to panelize the board in preparation for future pick-and-place operations (they are currently hand-assembled!). Perhaps even more interesting is that I also hope to be able to soon offer a frequency calibration report with every board sold. Thanks to LA3PNA, I am now in possession of a decent 10 MHz GPSDO to use as a lab reference, which will allow me to measure the frequency correction value accurately enough for hobbyist usage. I now have a small printer on hand, and so now what I need to do is add new code to my board test script to measure the correction value and print it for inclusion with each board sold. Stay tuned for notification when I’m ready to go live with this; hopefully soon. Let me reiterate: I’d love to hear your thoughts about the above proposals. I’m interested in serving the needs of my customers. Thank you! I know that the updates here have been extremely sparse. For that I do apologize. Things are slowly starting to settle into a new normal around here, and I’ve been able to regain the ability to put time back into work. There’s a large to do list on my whiteboard, and many of the things on that list depend on improvements and bug fixes to the Si5351 Arduino library. So that has been my first priority as I dip my toes back in the water. There were quite a few features of the Si5351 that the older versions of the library did not support, such as all of the 8 outputs of the variants excluding the A3 and the VCXO of the B variant. Also, there is a pretty big bug in how the tuning algorithm handles multiple outputs assigned to the same PLL, which causes tuning errors to crop up. Therefore, I decided in one fell swoop that I needed to totally rewrite the tuning algorithm and add support for as many of the neglected features as I could before moving on to other projects involving the Si5351. Over the last month, I’ve been hacking away on the code in my spare time, and I’m glad to finally be able to announce that a beta version of the Si5351 Arduino v2.0.0 library is ready for public use. Because it’s such a drastic change to the underlying code, I’d like to have it in limited beta release before doing a final release via the Arduino Library Manager. So that means that if you would like to try it (and I encourage you to do so), then you’ll need to install it manually, which isn’t terribly difficult. Go here and click on the green button on the upper right that says “Clone or download”. Select “Download ZIP”. Next, find where on your filesystem your Arduino libraries folder resides and delete the existing “Etherkit Si5351” folder. Inside the ZIP file you just downloaded, there is a folder entitled “Si5351Arduino-libupdate”. Unzip this folder into the Arduino libraries folder, and then restart the Arduino IDE. Since this is a new major version release, I took the opportunity to tweak the interface a bit, which means that you’ll have to adjust your current code to work with the new library (but fortunately not too much). You’ll find the details on how to do that here. Please check out the updated documentation on the GitHub page, as it has been greatly expanded and should explain all of the new features in detail. Also, quite a few new example sketches have been added to the library, which you can find in the usual place in the Arduino IDE. I encourage you to try the new library in your existing projects, as it should be a bit more streamlined and stable. Also, there is plenty of opportunity to make new projects with the B and C variant ICs. If you do encounter any problems with the new library version, I would like to strongly encourage you to use the Issues feature of GitHub to let me know so that I can get on to fixing it as soon as possible. When I’m satisfied that there are no big show-stopper bugs in the code, I’ll merge it to the master branch of the repository and tag it for release via the Arduino Library Manager, but I need help in testing it before I can do that. Once there’s a stable release of this version of the library out in the wild, then I’ll be able to move forward with other projects based on this Si5351. With any luck, some more interesting things will be coming from this shack again in the near future. Thank you for all of your help and support! Awesome work! Tom has been a great supporter of Etherkit from the beginning and I’d like to thank him for sharing his neat creations with the rest of us. It’s wonderful to see such a minimalist design perform so well! I haven’t had a ton of free time here, but I do get snippets of time occasionally where I can sit with my notebook PC for a bit and mess around. As mentioned in some recent posts, I’ve been revisiting coding for fun, and I’ve stumbled upon quite a bit of new resources that are new to me and that I thought would be good to share. The first one I’d like to mention is called Scratchapixel. I was curious about the mathematical methods behind 3D rendering, and some searching brought me to this exhaustive tutorial site. It’s not 100% complete yet, but most of the fundamentals of 3D graphics are already well-explained there. A fantastic resource if you are curious about the first principles of 3D rendering like me. A related site is called Shadertoy. Not by the same people, but also related to the topic of learning 3D programming. Shadertoy is a web application that lets you play with shaders in C++ inside a web IDE that can be updated on-the-fly. It takes a bit of CPU and graphics horsepower to run comfortably, but if you’ve got the capacity, it’s worth browsing the demos on the site just to see the cool stuff you can create with it. This tool was created by Íñigo Quílez, who also has a really cool home page with lots of tutorials and whitepapers. If you like demoscene stuff, then definitely check it out. Another neat find that I only recently discovered goes by the name of Rosetta Code. It bills itself as a programming chrestomathy site, which basically means that it’s a way to learn how programming languages are related in a comparative way. There is a large directory of different programming tasks, and each task page lists ways to implement a solution in a wide variety of languages. It’s a wiki, so not every page has every language implementation, but there’s obviously a ton of work put into the site, and most tasks have implementation in the major languages. Really fascinating and useful at the same time. That sounds right up my alley. I haven’t read the book yet, but I have skimmed it a bit, and it looks like the kind of things that I love: non-linear systems, physics simulations, fractals, and the like. When things settle down here a bit, I may tackle the book and re-write the sample code into Python. That would give me some more Python practice and force me to really think about the algorithms behind the text, not just blindly copying, pasting, and executing the scripts. Let me know in the comments if you found any of these links useful or fascinating, or better yet if you know of other links in the same vein. If you regularly follow science news, you may have heard of the Breakthrough Starshot initiative. In short, this is a study to create pathfinding technology that would allow the eventual launch of micro-lightsails with tiny mass to the Alpha Centauri system at a significant velocity (0.2c!) with a ground-based laser array. It’s probably a serious effort, as it is being privately funded to the tune of a whopping $100,000,000. No doubt, an extremely audacious undertaking. Sounds interesting, but what does this have to do with radio? Well, obviously there’s the issue of how you can get a usable signal back to Earth across a distance of 4-and-a-half lightyears from a craft that masses in 10s of grams. I was wondering about that exact engineering challenge when I came across this article in my feed reader today. It turns out that someone has studied how one might use the Sun as a gravitational lens for lightwave communication across interstellar distances. Claudio Maccone, an Italian physicist, has run an analysis and has determined that putting a receiver at distance of at least 550 AU from Sol will give the desired lensing effect for optical communications. Speaking before Maccone at the Breakthrough Discuss meeting, Slava Turyshev (Caltech) pointed out that the gain for optical radiation through a FOCAL mission is 1011, a gain that oscillates but increases as you go further from the lens. This gives us the opportunity to consider multi-pixel imaging of exoplanets before we ever send missions to them. But as Maccone told the crowd at Stanford, we do much better still if we set up a bridge with not one but two FOCAL missions. Put one at the gravitational lens of the Sun, the other at the lens of the other star. At this point, things get wild. The minimum transmitted power drops to less than 10-4 watts. You’re reading that right — one-tenth of a milliwatt is enough to create error-free communications between the Sun and Alpha Centauri through two FOCAL antennas. Maccone’s paper assumes two 12-meter FOCAL antennas. StarShot envisions using its somewhat smaller sail as the antenna, a goal given impetus by these numbers. So that would have to rate as the ultimate QRP DX, eh? I’m not sure how realistic any of this is, but I’m pretty sure the physics are well-established by now. Kind of makes the Elser-Mathes Cup look like small potatoes. I’m pleased to announce an upgrade to the Etherkit Si5351A Breakout Board with TCXO reference oscillator. In boards manufactured previous to today (and the ones kitted in the initial crowdfunded initiative), the TCXO used was a Fox FOX924B-25.000. It worked well and did the job it was supposed to, but has one flaw in certain situations. The compensation loop in this particular TCXO has relatively wide frequency adjustment steps that can become obvious when using the Si5351A Breakout Board in a very narrow band mode such as QRSS. 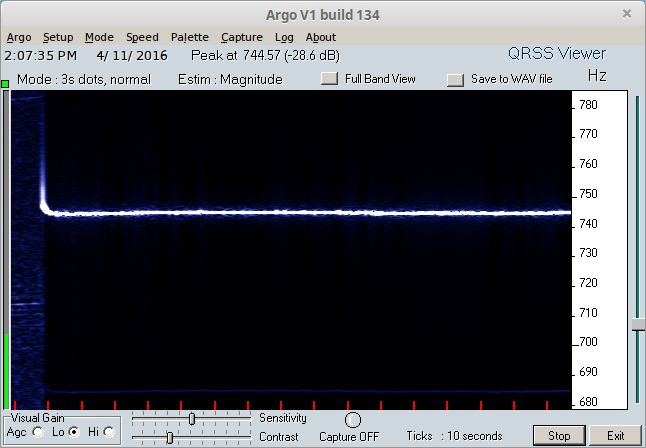 Here is a screen capture from Argo showing the behavior of the Si5351A Breakout Board with the Fox TCXO when outputting a carrier on 28 MHz, from a cold start. As you can see, as the TCXO is stabilizing to operating temperature, the compensation circuit adjusts the frequency in relative course steps of around 3 Hz or so. Once the TCXO is warmed up, it jumps around less often, but still does occasionally have to frequency correct, and does so in a jump of similar size. This TCXO is still fine for most other uses, such as a VFO for a SSB/CW radio, but doesn’t work so great for the MEPT modes, especially on the upper frequency range of the Si5351. In the course of developing OpenBeacon 2, I determined that I would need to find a more suitable TCXO to use with the Si5351. After trying about five different oscillators, I finally found a fantastic substitute, and it only costs a bit more than the Fox TCXO. The Abracon ASTX-H11-25.000MHZ-T comes in a smaller package than the Fox FOX924B-25.000, but it will still fit on the footprint for X1 on the Si5351A Breakout Board. Here you can see the same test as above run for the Abracon TCXO. It seems to find a stable frequency very quickly, and more importantly you can see that the compensation loop seems much tighter, with frequency corrections coming much faster and in smaller increments. You can only barely see a bit of fuzz from the frequency corrections on this low-bandwidth plot. This is much, much better for the MEPT modes. As of today, all of the Si5351A Breakout Boards with TCXO option sold in the Etherkit store will have the Abracon TCXO, and the price will stay the same at $15. As I mentioned in my previous post, we are still undergoing a stage of tremendous upheaval in our household. I won’t really know how our new life will shake out quite yet, but I am certain that my time will be more restricted. I think I’ll have a good grasp on the extent of this within a month or so. In the mean time, I’ve been thinking about Etherkit. It’s a bit weird to air this out on the blog, but I think it would be good for others to hear my thoughts about this and have the chance to offer feedback. The assumption is that I’m going to have less time to work on Etherkit (the only real question being how much less time), which means that if I do have enough time left to continue with the business I will need help by either outsourcing manufacturing or finding someone to bring on as a partner. If possible, I’d like to go that route, as I’m not really ready to see Etherkit fold up yet. This would also require more funding, so I would probably have to find a way to raise capital via the sale of equity, or perhaps I could crowdfund enough on a future product to keep things afloat. 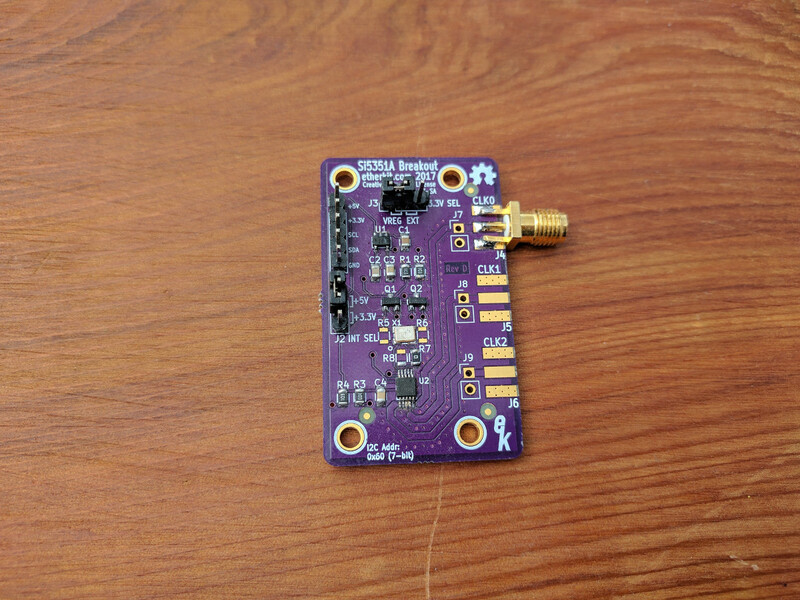 Right now I have in the product pipeline OpenBeacon 2, which is perhaps 80% finished (most of the remaining work is in firmware), and a handful of small useful RF modules. On the drawing board I have a couple of QRP transceiver designs utilizing the Si5351 that would definitely fall into the category of cheap and cheerful, and would probably be a lot of fun to bring to market. Also, since OpenBeacon 2 is based on the Arduino Zero, I’ve been discovering the power of the Atmel SAMD series of ARM Cortex-M0+ microcontrollers. I’d love to develop a dev board derivative of the Arduino Zero using some of the SAMD line that have a bit less flash storage and consequently are a bit less expensive. I think hams (and other hackers) would really like such a device. The other option is that due to time constraints I just cannot realistically continue Etherkit as an active business (at least regarding retail sales of physical stuff). If that happens, then I would still like to stay active in some way, under the restrictions in my available time. Perhaps writing may be a good choice, since that is quite portable and can be picked up and set aside a lot easier than designing electronics. Writing technical books, for a new blog that earns money somehow, or as a contract writer for an existing website are all possibilities. I’ve thought it might be nice to write about test and measurement for the ham’s home lab. Either way, I’m not done with the ham homebrew community. The open question is merely how much time I can still give. Let me know what you think about the above in the comments. It’s been a while since I’ve transmitted any RF on the amateur bands other than the testing that I’ve been conducting for OpenBeacon 2. Between how much time I’ve been putting into OpenBeacon 2 (and refining the Si5351 library), it’s been very difficult to find the time to sit down to operate. On top of that, I honestly just haven’t felt much of the operating mojo, so unsurprisingly I haven’t even tried to make it a priority. Generally, it’s not great to force these things, but I’m getting to the point where I’m feeling a bit disconnected from amateur radio and that I really need to be QRV again in order to rebuild that connection. 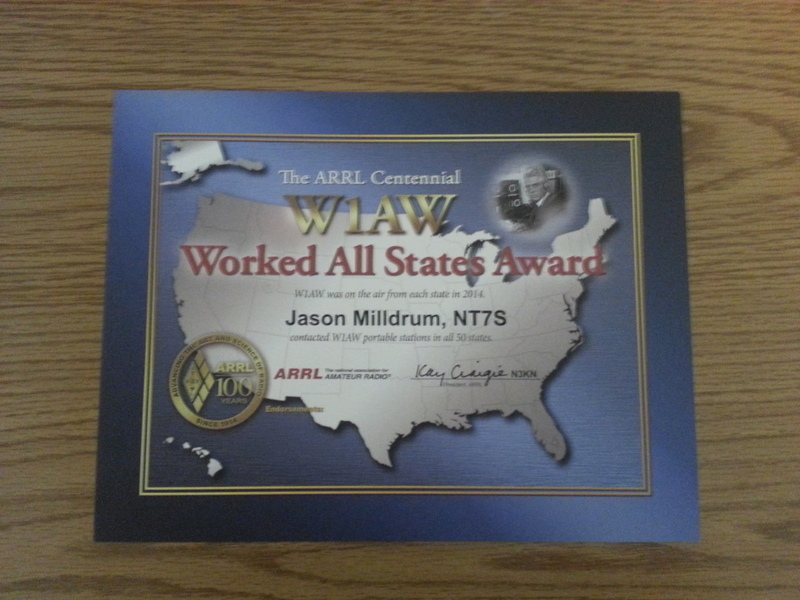 The ARRL Centennial in 2014 was a great operating year for me because it gave me a concrete and interesting goal to pursue. So I figure that I need something similar to get me motivated again. A good goal perhaps would be to finally finish up basic DXCC from this QTH. As of right now, I stand at 75 confirmed entities in LoTW. It shouldn’t be that difficult to get 25 more confirmations in LoTW by the end of the year, especially if I carve out a couple of weekends for contesting. I used to chase a lot of the big DXepditions as well, and that might be another good source to pick up a handful of ATNOs (assuming I pay whatever fee they charge for a prompt LoTW upload). 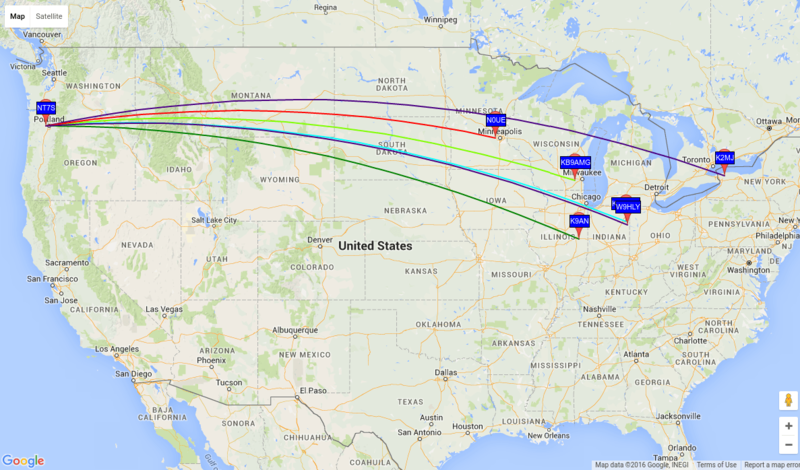 I’d also like to actually get a successful HF SOTA activation or two under my belt, and this would be a good summer to do that. Speaking of the venerable institution, I let my membership lapse recently. Not really with the mind to do so, but given the rather significant dues increase, it was becoming a bit more difficult to justify the expense. Yeah, they are only asking $10 more per year, but I have to ask myself if I’m getting $50 of value every year. I was honestly barely reading the QSTs that were arriving in the mail. However, the archives always have been one of the best features of the membership. I’m glad they do work with the FCC to represent our interests. Their lab does a good job of evaluating products. It feels that their organizational structure is a bit too ossified; a bit too hierarchical for my tastes. Getting feedback to the leadership seems difficult if you aren’t already connected to leadership. On the balance, I’m generally pro-ARRL, but I still don’t know that I see the value of just forking over $50 annually. I understand why they needed to do a rate increase (although it probably would have been better to phase it in more gradually rather than a 20% hit all at once). I also understand the economics of why it would be difficult to offer a membership without QST, unless a paper QST was scrapped entirely. I would be curious to see how the rate increase ends up affecting their member numbers and their bottom line. I know. I was just starting to get some momentum posting to the blog on a semi-regular basis, and then — the drop off. I am sorry about that. The Si5351A Breakout Board campaign consumed almost all of my work time. Given the limited amount of actual work time that I have, something had to give. So unfortunately it was blogging. There’s also a bit more unfortunate news, as well as good news. The bad news is that I don’t foresee having the time to post as many posts as I would like, so for now, content will slow a bit. The good news is that is because I will be focusing my blogging efforts into the brand new Etherkit App Notes site at appnotes.etherkit.com. I’m going to be working hard to supply fun DIY projects that you can build using Etherkit products, starting with the Si5351A Breakout Board, and involving other Etherkit products as they come online. In the meantime, it’s been very heartening to see all of the neat ways in which people have been incorporating the Si5351A Breakout Board into their own projects. For example, here’s a wonderful blog post and video from Mike N2HTT about how he constructed a multi-band VFO using the board and a 128×64 OLED display. 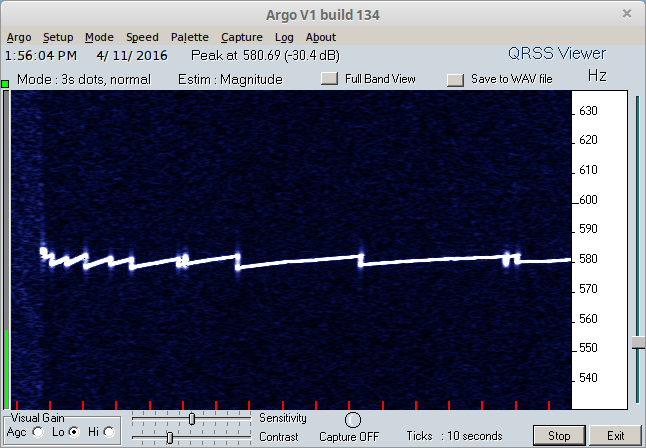 I also received this link from Milan about how he use the board to clock his DVB-T dongle for SDR reception. It allowed him much greater frequency accuracy, as well as a way to slightly shift the ref osc frequency in order to see which signals are external and which are internally generated. All very neat stuff! I won’t let this blog completely fade, but I will be putting most of my effort in to Etherkit-related work, so that’s where you’ll need to look to find most of my new content. Thanks for reading! 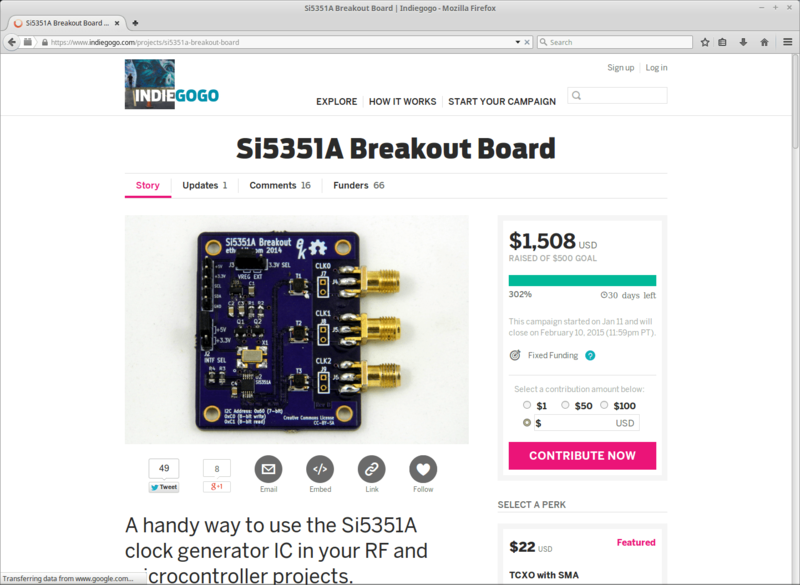 The Si5351A Breakout Board Campaign is Here! I’m pleased to announce that I’ve opened up the Etherkit Si5351A Breakout Board campaign for contributions! Please stop by our Indiegogo page to get much more information on what we are offering, and how you can help to support us even if you don’t plan on purchasing a kit. We did a soft launch yesterday afternoon on Twitter and had a phenomenal response! We hit our initial goal of $500 of funding within about 6 hours of my initial Twitter post indicating that the campaign was open. With any luck, we should be able to hit the stretch goal by the time that the 30 day campaign has elapsed. I would like to sincerely thank everyone who stepped up early to back our campaign and those who took the time to retweet, blog, and post about our campaign to listservs and other influential media people. I am utterly humbled by the level of support out there. 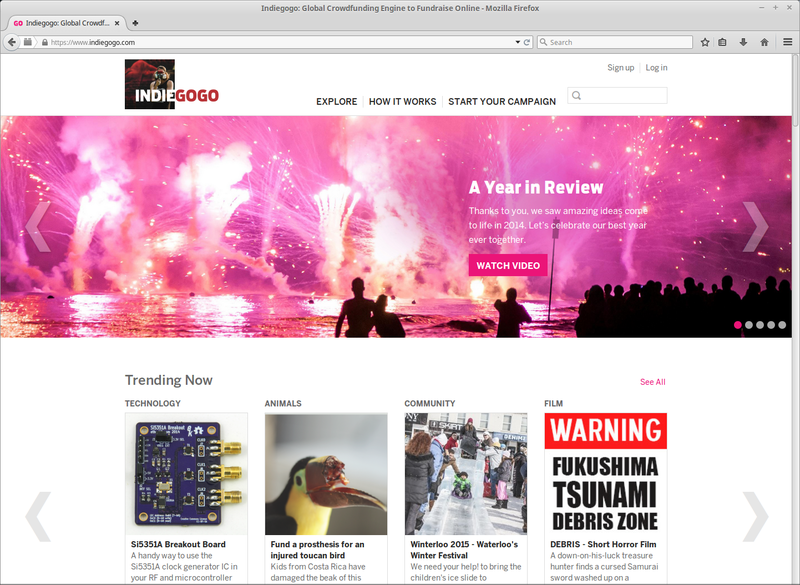 Update: As of 1600 UTC 12 Jan 2015, we have made the front page of Indiegogo as a trending campaign! Thank you to everyone who has supported us! Just a few days ago, I finally received some of the TCXO parts that I’ve been planning on using with the Si5351A Breakout Board. I had no problem using one on the remaining prototype circuit board that I have, and at first glance it appeared quite stable and also very close to the nominal frequency (my correction factor for this one was only 8 Hz at 10 MHz). Direct comparisons are always the best way to do things, so I ran the Si5351 with TCXO through my thermal chamber at the same profile that I did in the last test in my initial blog post. Rather than write a whole new blog post, I updated the original post to keep that data together, which will be handy for future reference. Go forth and look at the update at the bottom of the original post. Thanks!